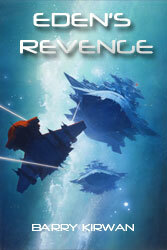 Eden's Revenge is selling reasonably well, mainly in US and UK. The publisher and I are preparing the paperback for launch in November, though I hope to have some advance copies for when I go to the UK Writers' Festival in September (York University). I then plan to do another book launch in my home area (at Waterstones in Camberley) sometime in December. The final book, Eden's Endgame is in progress, five chapters done so far. I know the end, but it's that pesky middle bit as usual that is the problem. Still deciding exactly who is left standing at the end of this series, though clearly my fans want a certain person seriously dead... I take a week off in a few week's time and will be in Hong Kong for tai chi, but when not training, I'll be writing, probably in Starbucks because it is air conditioned (Honkers in August is very hot and humid). So far book 3 has good reviews, a couple of people had hoped it would be a true trilogy, but admit they are quite looking forward to having another book. Some don't want it to end at 4, and a few have asked for a Prequel (they like the Prologue in Eden's Revenge set in the 16th century), but I'm going to keep it to 4. I'm sure of it. Promise. Probably, LOL. Cover art is being prepared for the final book (anticipated launch date April 2014) by artist John Harris, I should have some sketches in a month or so. I interviewed Aliette de Bodard yesterday in sweltering Paris. She is a celebrated SF author and winner of 2012 Nebula and 2013 Locus awards for best short story (you can read it here) - very interesting - it will be published in Paris Writers News in due course as part of their 'writers on writers' interview series. I'm also co-writing a book for work, which is non-fiction, which is interesting to do after writing mainly fiction for some years now. I'll try not to have any aliens or space-ships in that one (except Challenger and Columbia).